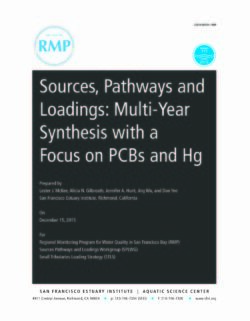 This report provides a synthesis of information gathered since 2000 on sources, pathways, and loadings of pollutants of concern in the San Francisco Bay Area with a focus on polychlorinated biphenyls (PCBs) and total mercury (Hg). Concentration and load estimates for other pollutants of concern (POC) are provided in the Appendix tables but not supported by any synthesis or discussion in the main body of the report. The PCB and Hg TMDLs for San Francisco Bay call for implementation of control measures to reduce stormwater PCB loads from 20 kg to 2 kg by 2030 and to reduce stormwater Hg loads from 160 kg to 80 kg by 2028 with an interim milestone of 120 kg by 2018. These are very challenging objectives given that the 2 kg PCB load allocation translates to a mean annual yield of 0.31 g/km2 for the free flowing areas downstream from reservoirs (6,650 km2), a mean annual concentration of 1.33 ng/L (assuming an annual average flow from small tributaries of 1.5 km3), and mean annual particle ratio of 1.4 ng/g of suspended sediment load (assuming an average annual suspended sediment load of 1.4 million metric t). Similarly for Hg, the 80 kg load allocation translates to a mean annual yield of 12 g/km2, a mean annual concentration of 53 ng/L, and mean annual particle ratio of 58 ng/g of suspended sediment load. Concentrations of these low magnitudes have been observed commonly in the Bay Area for Hg and yields of this low magnitude have been observed for PCBs and Hg. However, concentrations of PCBs at these magnitudes have only been observed in Marsh Creek (a more rural watershed) and particle ratios of PCBs and Hg as low as these have never been observed in the region.